« Noted Endeavors with Steven Swartz, Part II: What does a publicist do? 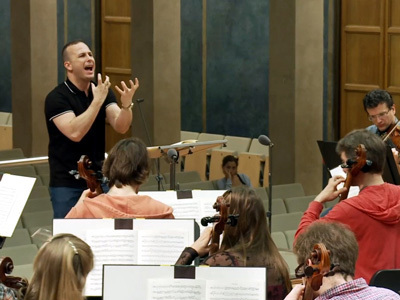 MUNICH — It would probably be asking too much for Yannick Nézet-Séguin to stand still while conducting. He likes to throw himself around, as if anything less might diminish the enthusiasm he intends to convey or deprive his musicians of essential signals. Mostly it works. He is after all a success. Yesterday (June 25) in the Herkulessaal here his physical language neatly fit every idea in Haydn’s E-Minor Trauer Symphony, No. 44 (1771), and contradicted every breath of Brahms’s German Requiem (1868). Despite its name the Haydn does not overtly relay mourning, although its Adagio has a certain sadness, with violins con sordini and lines tending to descend. The Bavarian Radio Symphony Orchestra played the four movements affectionately, lending charm to the two-voice canon of the second and preserving clarity in the Finale, taken prestissimo by the scoreless Canadian maestro. The audience listened in rapt silence. Closing one’s eyes for the Brahms solved part of the problem on the podium but left an interpretation insistent on bright color and drama, and not only in the second and sixth movements. Forget introspection. The BR Chor sang glowingly and with considerable power as prepared by Michael Gläser. The soloists were disappointing. Christiane Karg lacked ideal control and vocal weight for the soprano’s ethereal Ihr habt nun Traurigkeit. Baritone Matthias Goerne sounded firm in the low notes, but he swallowed consonants and staggered about like a drunk at a banquet, without tie, forearms and belly thrust forward. (Memories of José van Dam and the dignity he brought to this assignment, mostly motionless, accentuated the sad spectacle.) The orchestra mustered passion as well as its customary precision even if flute and oboe lines often pierced the air. At the end, after shaping Brahms’s masterwork so theatrically, Nézet-Séguin stood in place for a long, contrived silence, intended presumably to register the music’s meaning. Today’s performance of the same program (June 26) will be broadcast by BR Klassik, and the German Requiem will no doubt find its way to disc. This entry was posted on Friday, June 26th, 2015 at 4:07 pm	and is filed under Munich Times. You can follow any responses to this entry through the RSS 2.0 feed. Both comments and pings are currently closed.